This super fun family meal was a huge success around here. My 11 year old daughter ate 3 bowls and the little ones were so curious they forgot to fuss about the “green stuff”. 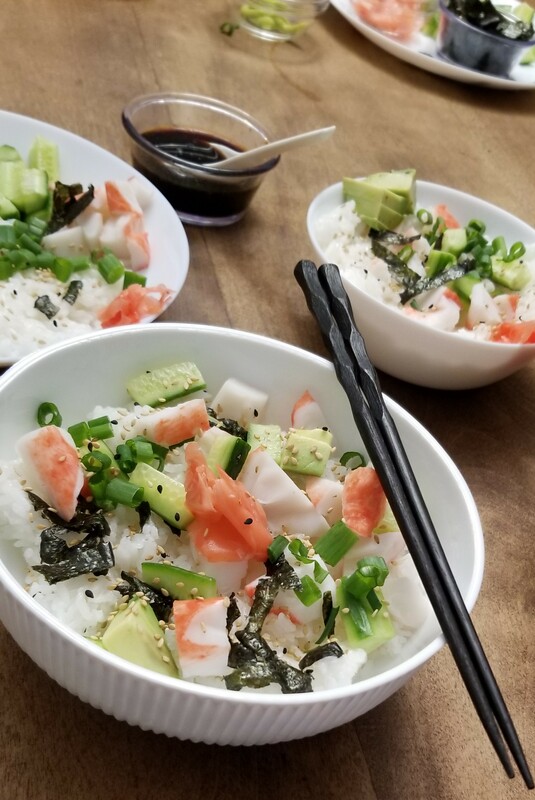 Sushi bowl is a great “make it yourself” kind of meal, so this isn’t actually an organized recipe. It is all up to you! The ingredients are what made California rolls so popular: mock crab sticks, dry Nori seaweed, avocado, cucumbers and sushi rice. Some people like carrot sticks in theirs, so feel free to add those too! I like to present all the prepped ingredients right on the dinner table and have everyone assemble their own. Behold! Sometimes lazy can be cool! The quantities are really up to you, the number of mouths you are feeding and your personal preferences. Sushi rice: prepared according to the package instructions. I make mine in a simple little rice cooker I bought ages ago, with a ratio of 1 cup rice for 1.5 cups of water. I season my cooked rice with sushi rice vinegar. Mock crab sticks: shredded or cubed. Cucumbers: peeled or not, cubed or julienned. Since I let my kids help, my cubes ended all beefed up, but hey, no body’s perfect. Avocado: sliced to pretty half-moons or simply cubed if you are as hungry as we were. Pickled sushi ginger: because it is pink, pretty and it aint really sushi without it. Soy sauce for drizzling: I like to jazz mine up with a bit of lime zest and some rice vinegar. Sriracha mayo sauce: just mix mayo and Sriracha hot sauce, as much as your palate can take. That’s it folks! Serve all those colorful tidbits with your rice, assemble and enjoy!